So here's a beer everyone will tell you is the best ever. A score of "98" on Beer Advocate, "4.35" on Untappd. Yes, the Enjoy By is definitely a beer everyone sits around and sings kumbaya about. Except... I don't quite get all the praise. I mean, don't get me wrong, this is a very, very good beer. But the best IPA ever? I'm not so sure. It's obviously a fresh beer -- note the name telling you to drink this by 4/20 (what's the over/under that one was on purpose) -- but I have a feeling people have gotten somewhat blinded by the hype of it all. It looks beautiful, definitely, all golden, with a frothy two fingers worth of head. Give it a sniff, it comes off as being very, very fresh. Citric, definitely, with a subtle hint of the 9.4% of ABV, and a definite reminder of the hops to come. Now, here is where it "all falls apart". That's of course a hyperbole; it doesn't fall apart at all, and this is really a very, very good IPA. But, with all the talk of the Enjoy By's smoothness... I don't quite get it. The citrus is theare, definitely, as is the caramel. All as expected, and very fresh and tasty. The hops hit just in the top of the mouth and kind of lingers, and there is where it goes wrong for me. I rarely have an issue with what some call a "soapy" aftertaste, but it's here, and it is just a bit soapy. Kind of a less than stellar reminder of the hops and the booze, if you like. It's not downright awful, but it's not pleasant either. I'm really not trying to be a contrarian here, and I strongly recommend anyone to buy the beer should they stumble upon it. It's well worth the very affordable $7 -- Deschutes would in all probability double that price point. So drink it, but do so with an open mind. I'm not sure you'll be quite as blown away as some. 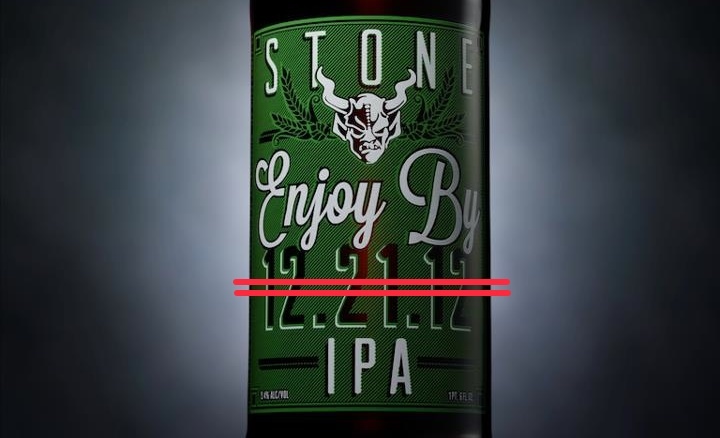 Do you recommend Stone Enjoy By 04.20.13 IPA? Make your voice heard!